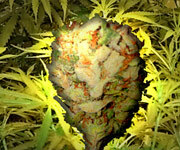 Big Bud Seeds | Buy Cannabis Seeds that Offer More Up Top! For some people, possibly you, size is everything. If you like your weed seeds to have the potential to fill an entire forest with splendidly stinky cannabis that even Mr Nice himself would struggle to get through in 10 lifetimes, then you will be grinning like a crazy person when you see what these seeds can do. The challenge for breeders with big ambitions is to be able to produce seeds that can deliver bulging buds without sacrificing any of the strength or flavour of their spectacular seeds. They do this spectacularly well by selecting wisely then expertly breeding out the smallness genes and adding in the bigness genes. (That’s real science language honest.) At the same time, while they’ve got their white coats on, they tend to boost the THC and ensure the potential smell is ultra-awesome too, so don’t think these are seeds with only one trick up their sleeves. Give your seed collection a green meat injection today so you can show off your bulging bud seeds like never before. Get Your Big Bud Seeds Now!